The projects in this book are designed to be used with the noted Children's Corner Patterns. Includes some light drafting to alter patterns that you may already own. The instructions included in the patterns will be needed along with the instructions included in this book for each project. Projects using only one pattern use: Johnny, Lillian, Lucy, Blair, Frannie, Frannie Baby. Projects using patterns together are Adelaide with Kathy, Lettie with Carol or Lucy, Mary De with Lucy, Taylor as a top with Jackson bloomers. Childrens Corner CC013 Amy Smocked Jumper Dress Sewing Pattern Size 5-8, Smocking design is included. 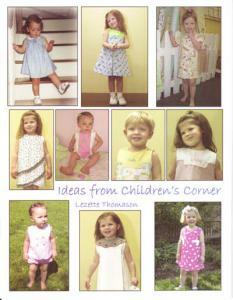 Childrens Corner Cc243 Becky Sewing Pattern, Bloomers and Top Set Sizes 6 mo.-24 mo.